One of my recent cookbook acquisitions is World Vegetarian by Madhur Jaffrey, which has some 650+ recipes from around the world. With the hot weather we've been experiencing over the last couple of days, it seemed like the perfect time to make something light and refreshing. I flipped through the pages of my new cookbook and came across her recipe for a soup that did not require any cooking. Just the thing I was looking for! Here's my version of the recipe. Throw all the ingredients together in the blender and process until smooth. Chill and serve. We had this tangy soup along with a bean salad. TBC, trust u to come up with recipes providing visual treat n tasting fab at the same time! Avacados n buttermilk..unusual combo!! :D Tooooo goooooood! How easy and refreshing :) I've read good things about this book from several blogs - must check it out. That soup looks very unusual and interesting! So how do you like that cookbook?? It is one of my favorites. Delicious for a warm summer day. Wow, this sounds amazing. I love avocado. The chives on top look so fresh and good. you actually went through that fat book? we've had it for over a year now and have simply been staring at it. Wow, it's such an innovative recipe. Hope to see more recipes from that book. Definitely good for summer. Wow, that's a delicious soup, TBC! Lovely cup too. Right on time for the summer, was wondering about what cold soups were out there. This will be made this week. the soup looks delicious..but i can't seem to get over the fact you used a mortar and pestle :D for grinding stuff...kya ho gaya tujhe!! I have owned a copy of that cookbook for a few years now and it is one of my favorites. You may have noticed that I often refer to it on my blog. I've not tried this though, but I likely will this summer. Sounds perfect. Very cool recipe and a new way to use Avocado! I love such recipes which have basically one instruction. ...throw everything in the blender. That sounds really interesting and isn't something I would have thought of. Something about avocados always trips me up and gets me stuck in guacamole mode. This looks good! I tried this yesterday evening and it came out very well. An avocado soup sounds really interesting! Sangeeth, Rashmi, Rachel, Notyet100, Sunita, Asha, Happy Cook, Arundathi, Vegeyum, Madhuram, Uma, Red Chillies, Nags, Easycrafts, Cris, Karuna, Kevin- thank you all for your sweet comments and words of encouragement. I am glad you got a chance to try it. Viji- It is so nice to see you here! How have you been? Very interesting recipe! :)) Simple too! Wonderful idea I would love to try this soon ! Mmmmm...does that look good...and easy. 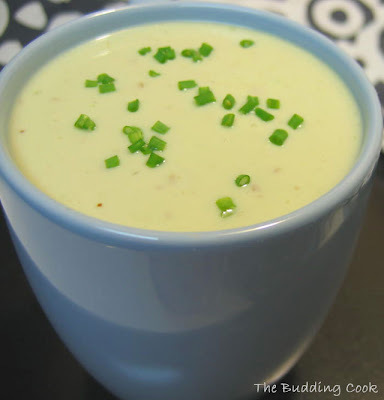 A lot of people aren't keen for cold soups, but I beg to differ. The soup looks too good! This looks fabulous! I heart avacados, I need to give this a shot! I liked this one though, coz it tastes so much like our lassi- a cool drink that is yogurt/buttermilk based. Mmmm that looks delicious and ... refreshing? in some way.